This is a scalable context timeline. It contains events related to the event February 24-27, 1993: BATF Prepares for Branch Davidian Raid. You can narrow or broaden the context of this timeline by adjusting the zoom level. The lower the scale, the more relevant the items on average will be, while the higher the scale, the less relevant the items, on average, will be. 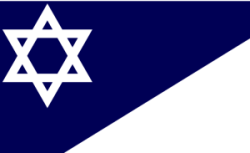 The flag of the Branch Davidians. [Source: Wikimedia]Vernon Wayne Howell, a Texas musician and a member of the Branch Davidian sect of Seventh-day Adventists, forcibly installs himself as the leader of the Branch Davidian sect near Waco, Texas. Howell is a self-described loner and dyslexic who dropped out of high school, but taught himself the Bible, memorizing most of it by age 12. He was expelled from the Church of Seventh-day Adventists in 1979 for being a bad influence on the church’s young people, and in 1981 joined the Waco group of Branch Davidians in its 77-acre compound, “Mount Carmel,” on the outskirts of the city. Howell had an affair with the leader of the group, self-described prophetess Lois Roden, some 30 years older than himself. Stephen Higgins, the former head of the Bureau of Alcohol, Tobacco and Firearms (BATF, sometimes abbreviated ATF), publishes an op-ed for the Washington Post explaining why his agency mounted a raid on the Branch Davidian compound outside of Waco, Texas (see 5:00 A.M. - 9:30 A.M. February 28, 1993). 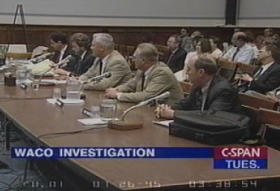 Higgins says he wrote the piece after watching and reading about the public reaction to the Oklahoma City bombing (see 8:35 a.m. - 9:02 a.m. April 19, 1995), which many claim was triggered by the Waco debacle (see April 19, 1993). Higgins says a raft of misinformation surrounds the BATF raid on the Davidian compound, and gives his rationale for the raid. Davidians Posed Clear Threat to Community - Higgins says that it would have been dangerous to assume that the Davidians were peaceful people who did not plan to actually use the weapons they were amassing, and repeats the claim that Koresh said in late 1992 that “the riots in Los Angeles would pale in comparison to what was going to happen in Waco” (see December 7, 1992). Higgins goes on to say that during the 51-day siege, Koresh alluded to a previous plan to blow up the dam at Lake Waco, that Koresh wanted to provoke a confrontation with the BATF, and had at one point considered opening fire on a Waco restaurant to provoke just such a conflict. BATF Feared Mass Suicide - Higgins notes that the BATF, like the FBI, feared the possibility of “mass suicide” (see February 24-27, 1993, Around 4:00 p.m. February 28, 1993, March 5, 1993, March 7-8, 1993, March 12, 1993, (March 19, 1993), and March 23, 1993), and gives several examples of cults who have carried out just such mass suicides. The cover of Conway and Siegelman’s book ‘Snapping.’ [Source: aLibris (.com)]In their book Snapping: America’s Epidemic of Sudden Personality Change, authors Flo Conway and Jim Siegelman write of their recent interviews with several law enforcement officials who dealt with various aspects of the Branch Davidian siege (see 5:00 A.M. - 9:30 A.M. February 28, 1993), the final tragic assault (see April 19, 1993), and the aftermath. Assault Did Not Follow Plan - The plans as approved by Reno never contained an option to attack the compound with armored vehicles. “Please keep in mind that there was no plan to demolish the compound. As we said at the time, it was not D-Day. The original plan was a two-day plan for gradual insertion of gas to progressively shrink the usable space and continually encourage people to come out.” The assault was carried out entirely differently; when the Davidians began firing automatic weapons at the armored vehicles and at personnel, ground commanders abandoned the plans and ordered an all-out assault with tear gas and armored vehicles. Even weather conditions played a part in the final conflagration. “No one anticipated the wind,” Stern recalls. “The tanks were not supposed to strike the building, but because of the wind, the gas wasn’t getting in and they had to get closer and finally insert the booms through the window millwork. In the course of doing so, they struck the walls and the roof.” Stern recalls the moments when the fires erupted throughout the compound. “I was in the SIOC [Strategic Intervention Operations Center] when the fire broke out. At first, Floyd Clarke, the FBI’s deputy director, thought an engine had blown on one of the vehicles they had rented from the Army. They didn’t realize what had happened. Then, when it became clear that it was a fire, they all sat there waiting for the people to come out. They were saying, ‘Come on baby, come on out, come on out.’ They were expecting people to come flooding out and there were no people coming out and they were absolutely incredulous. Even when it was over, they were still assuming they would find the kids in the bus they had buried underground.” Stern says FBI and DOJ officials were stunned at the realization that the Davidians had, in essence, committed mass suicide. “All I can tell you is that, given the atmosphere at the time, it was a surprise the suicide occurred. Remember, by then, most of the children in the compound were Koresh’s own. The thought that he would permit his own children to be harmed was inconceivable.” Conway and Siegelman point out that those experienced in “cult” “mind control” techniques had, indeed, anticipated just such an outcome. 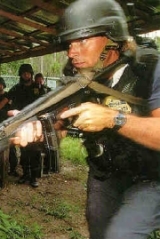 They theorize “that ranking FBI officers, tired of being manipulated by Koresh and, no doubt, genuinely concerned for the precedents they were setting for future confrontations, may have misguided the attorney general into giving ground commanders too much leeway in the execution of the final assault plan—leeway that, as the tank and tear gas assault progressed, unleashed the full destructive potential of Koresh and the people under his control. However, in our view, that gaping hole in the government’s strategy was not wrought by any battering ram or armored vehicle. Amid the push and pull of the government’s internal debate, the failure of FBI officials in Washington and Waco to heed warning that the cult’s destructive urges would ignite under pressure hastened the demise of the doom-bent Davidians.” The Davidians were never Koresh’s hostages as the FBI viewed them, the authors conclude, but willing participants willing to die for their leader and for their beliefs.